The following is a selected list of reviews, writings, and publications. BOMB Magazine, A Punch in 4/4 Time by Angel Nevarez and Valerie Tevere, March 2017. Textual Records, The fog of Manchester hangs heavy in Jalisco, Nato Thompson, May, 2009. 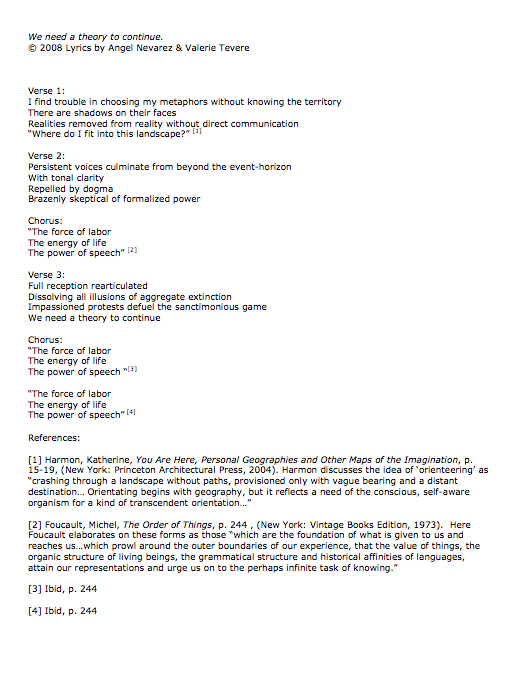 Lyric Sheet , We need a theory to continue., Angel Nevarez & Valerie Tevere, 2008. The Huffington Post, Increasing Public Space with Ice Cream, Karaoke and Magic, Nato Thompson, 9/22/08. Village Voice, Fall Preview: Artists Soldier for Democracy at the Park Avenue Armory, Daniel Kunitz, 9/03/08. New York Press, ARTS BRIEF: Popsicles and Propaganda, Jerry Portwood, Sept. 2008. La Jornada, Touching from a Distance, un retrato de la Plaza Liberación por dos artistas de EU, Cecilia Duran, 4/17/08. Milenio, Tocando a distancia se escucha con mariachi, Edgar Velasco, April, 2008. Bidoun Magazine, The FM Ferry Experiment*, review by Media Farzin. ArtInfo, Political artists peddle ice cream and karaoke, Lyra Kilston and Quinn Latimer, Sept. 19, 2008.